In my never-ending quest to clearly explain the devastating effect of investment fees on your savings, I’ve found another way to look at it. 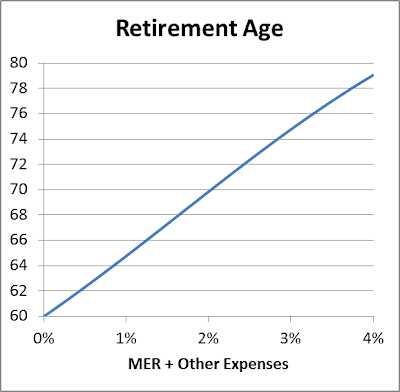 Instead of looking at how much of your money gets consumed by mutual fund fees, let’s look at how they affect your retirement age. The answer depends on how her RRSP investments perform. For illustration purposes, let’s assume that her investments beat inflation by 4% per year, before investing fees. Of course, she can’t count on this, and returns vary considerably from one year to the next. But the goal here is to see how fees affect retirement, so we’ll do calculations based on a steady 4% real return. So, if Katie manages to keep her expenses down to 0.2% per year (including MERs, commissions, and spreads) using inexpensive index ETFs and trading infrequently, her projected retirement age is 61. If she invests in the Investors Canadian Growth Fund with total fund costs of 3.02% per year, Katie’s projected retirement age is 75. That’s 14 extra years of work to pay the higher fees. Even if we properly account for Katie’s chosen asset allocation, the variability of investment returns, and the need for more safety after retirement, fund costs will still cause a major shift to a later retirement age. Here is another, much simpler one, I have done recently after reading a friendly credit card statement that explained to me that if I pay the minimum payment of $72 per month it would take me 15 years and 9 months to pay off my current balance of $1995. This is $13,608. @AnatoliN: Good one :-) Fortunately, there are a few financial advisors who cheer me on. I'm with Gail Vaz-Oxlade on credit cards. If you carry a balance, you shouldn't have a credit card. I love these posts from you.You say what needs to be said that only a few seem to want to hear. Thanks for another refreshing year of great blog posts and helpful ideas. Please keep them coming and keep the pressure on regarding fees. With all the talk about having to prop up our pension system why doesn't anyone suggest that we simply keep more of our money in our existing RRSPS ? Maybe make the tax rate 10% on withdrawals? Make payroll contributions mandatory but to our own locked in plans? God only knows what disaster our elected officials will create with our money? There can't be a middleman charging crazy fee's. When this issue came up originally on a Federal level a few years back, the MF companies started a mini fight with the finance minister. They wanted to administrate the new PP. and charge their usual fee's. I was hoping you could address the pension issue in one of your forthcoming posts. 1. Some people don't save. 2. Fees are ridiculously high for most people. 3. Longevity risk forces people to spend less per year in case they live a long time. It's hard to solve all 3 problems with RRSPs (but maybe not impossible). @Paul Lee: Most people need some professional advice. The problem is that so many pay handsomely for advice and get just a mutual fund salesperson. @Paul Lee: The cost of advice is in the illustration. Those who don't need advice, like me, are near the left side. Those who have enough savvy to get advice for a reasonable price are a little further to the right. Those who are oblivious to costs, but get little meaningful advice for their money are way off to the right. That's a nice way to see the impact of investment fees over the long run. I like to look at the increased amount one would have to save in order to compensate for the effect of investment fees and achieve the desired retirement income. I view that increase as the true fee. In your example, if Katie wants to save 1000 monthly and retire at age 60 with 3000 monthly income (no fees), then with a 2.5% fee she must save 2200 monthly. So a 2.5% fee has the effect of a 55% fee applied to her monthly saving, i.e. 1200 is taken from Katie's 2200 deposit. Similarly a 1% fee is really a 27% fee (Katie must save $1,370 in that situation), and 3% is really 61%. @Anonymous: That's valid way of looking at it as well. My way of expressing it is more for people who feel they are saving what they can and want to know when they can retire. Great example Michael! Telling people a 0.15% MER is better than a 3.5% isn't as effective as saying hey a bigger MER will cost you x number of extra years of work. @Kanwal: Thanks. Different ways of explaining fees seem to resonate with each person differently. Do Stocks Become More or Less Risky Over Time?